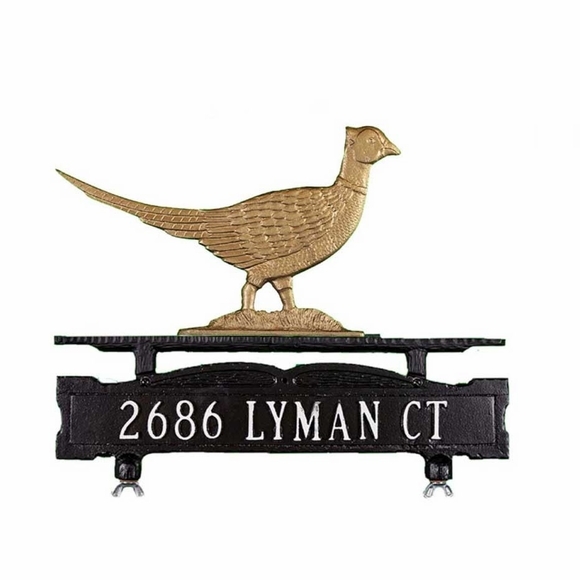 Pheasant Ornament Mailbox Address Sign - - two-sided address plaque with either one or two lines of personalization and a regal pheasant on the top. Made in America. Personalized address plaque designed to be mounted on the top of a curbside mailbox. Pheasant colors: gold bronze, swedish iron, and multi-color natural. Personalized address sign for mounting on a rural mailbox. Includes pheasant ornament.